Car Headrest Mount Tablet Holder Rotating Cradle Back Seat Dock Stand Kit Black. Excellent if your device is in a case or skin (or without). These mounts are what you need so that your back seat passengers can watch movies or play games. Great for keeping the kids occupied during those long trips. Headrest Tablet Car Mount is a handy accessory designed to instantly turn your tablet into a rear-seat in-car entertainment system. It is easily and securely installed into any car with adjustable headrests to fit headrest posts from 3.15" to 7" apart (80mm to 180mm) with a diameter of 0.55" to 0.70" (14mm to 18mm). The Headrest Car Mount comes with adjustable mounting arms to quickly and easily adjust for optimal viewing position and angle. It features open design to provide complete access to On/Off/Sleep/Wake button, volume controls and dock connector. The adjustable bracket arms can accommodate devices from 5" to 8" wide and up to 0.5" deep (125mm to 205mm & 10mm deep) to work great with other flat-panel devices such as e-book readers, LCD screens and more. 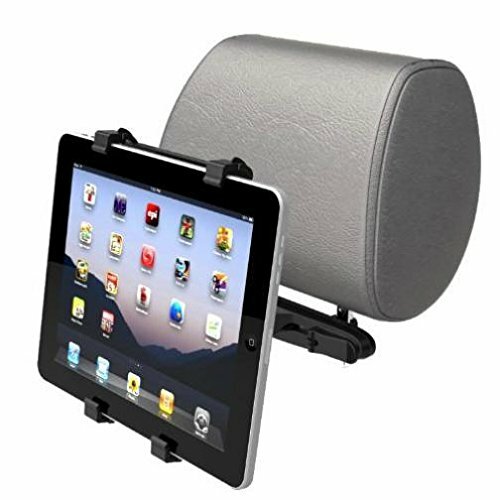 With the durable and easy to mount Headrest iPad Car Mount , you can turn your iPad into a large screen rear-seat in-car entertainment system, enjoy instant access to email, internet, music, videos, images and other tablet applications. Easily attaches to most headrest posts, No installation required. Adjustable clamps to fit most car models! Great for keeping the kids entertained during those long trips. Made from ABS plastic. Adjustable Size to fit for difference size of Tablets from 5 inches to 11 inches. Maximum weight load: 5 Kg (11 lb). Easily adjustable mounting arms to adjust to optimal viewing angle. Full access to all of your tablet features. Quickly and easily turns tablet into rear-seat in-car entertainment system. Works with iPads/Tablets with or without skins. If you have any questions about this product by ANSEWIRELESS, contact us by completing and submitting the form below. If you are looking for a specif part number, please include it with your message.